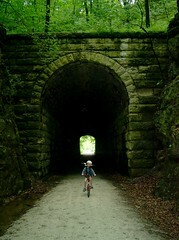 For off-road trails, rail-trails, and single-track mountain bike trails, see the MO Trails page. For gravel grinder and bikepacking routes featuring Missouri's amazing system of gravel roads, visit the Missouri Gravel Grinder and Bikepacking page. For more information about bicycle and trails route and trip planning, visit our page with Resources for planning Missouri bicycle and trails trips and routes. Have we missed a trail in your part of the state? Leave a comment (bottom of the page) and we'll integrate your info into future versions of this page. 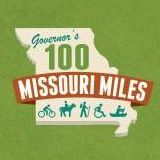 VisitMissouriTrails.com - A new guide with the ambitious goal--still in progress--to create comprehensive list, guide, and map to every trail in Missouri, from multi-use trails to mountain biking trails, single-track trails, hiking trails, equestrian trails, motorcycle trails, and ATV trails. This amazing resource compiles trail information from dozens of agencies and organizations and lists every trail in Missouri along with directions, trailheads, information about allowed trail uses, and trail maps. A complete list of bicycle trails and multi-use paths in Missouri (Rail-trails, greenways, and the like). 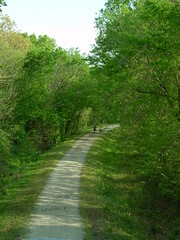 BikeKatyTrail.com is a site with all manner of information about the Katy Trail, destinations, accommodations, and travel information. It has an active discussion area. Highly recommended! The 2004 MS150 used a nice route (see map, PDF format, 6 MB) from the Kansas City area to Windsor, which is near the western end of the Katy Trail. Combining that map with the second day map (PDF, 4MB) also gives a nice route from Sedalia to the Kansas City metro area. For ideas about getting from anywhere in the KC Metro area to the starting point of these maps, look at the Kansas City, MO Bicycle Map (PDF), the Kansas City metro area bicycle map, this bicycling map of Jackson County, MO, or use Google Bicycle Maps (though Google Maps usually does not find the optimal bicycle route). MoBikeFed's Rock Island Ramble route page shows a couple of nice routes from Lee's Summit (Amtrak station) to Pleasant Hill. This map shows one of several possible on-road routes from Pleasant Hill (edge of Kansas City metro area) to Clinton, Calhoun, or Windsor (west end of Katy Trail). Amtrak will take you and your bike to several points on the Katy Trail, and shuttle services are available all along the trail. Several Missouri cities now have good, safe access from their Amtrak stations to the Katy Trail - Sedalia, Jefferson City, and Hermann. Washington has an Amtrak station but the Missouri River Bridge connecting to the Katy Trail is narrow and difficult. 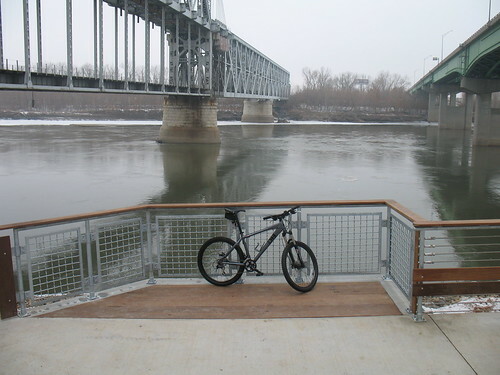 The city of Washington and MoDOT are working to build a new bridge that will include bicycle/pedestrian accommodations; construction may start in 2014 or 2015 at earliest. Read about taking your bike on Amtrak. Warrensburg - a fairly good, though circituous route is possible from Warrensburg to Clinton or (better) Windsor. See the Draft Missouri Bicycle Maps, specifically the KC District map, for ideas. Kansas City/Union Station or Independence - disembarking at Union Station or Independence and bicycling to the Katy Trail is not recommended unless you enjoy urban cycling on roads with few or no bicycle routes marked, and you are are already familiar with the area or willing to work out and follow detailed routes. You can find maps and resources for bicycling in the Kansas City area here. Missouri Rock Island Trail, Inc. - the non profit coalition of citizens and communities dedicated to preserving the Rock Island Corridor and building a hiking and biking trail along it. The American Discovery Trail--a network of on- and off-road routes stretching from the Atlantic to the Pacific oceans. The route through Missouri goes from St. Louis to Kansas City and uses the Katy Trail to cover much of the distance. 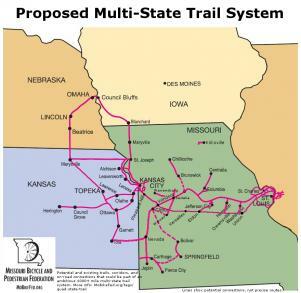 The Quad States Trail plan--a plan to develop a comprehensive trails system in four states (actually five now), centered on Missouri. Missouri Mountain Bike Trails listed and reviewed by users at MTBReview.com. Resources to help with developing rail trails, Rails with Trails, greenway trails, etc. KCMO's BikeKC page has information about current and planned on-street and trail routes, including the BikeKC map (showing existing & planned routes) and the TrailsKC Plan. Smithville Lake single-track biking/hiking trails (Kansas City area). This map of the Smithville Lake trails is also available and more info about the trail is on the EarthRiders web site. Northland Trails & Greenways and Northland Trails Vision Plan--planned multi-use trails throughout Clay and Platte counties. Right now most of these are still in the planning stage; a few are under construction and a few more are already on the ground. Interactive map of St. Louis area multi-use trails (west of the state line) from Great Rivers Greenway, the regional trails and greenway district. Ozark Greenways, Springfield, has a list of area trails, including trail maps--including eight greenway/multi-use trails totaling over 60 miles, the Sac River Mountain Bike Trail, and the James River Water Trail. What great Missouri trails have we missed? Please list your favorite trails in the comments section below--if possible, include a web site with more information about the trail, and we will include your suggestions in future versions of this page. Kansas City area trails for hiking and mountain biking - directions, maps, and more | Urban Trail Co.
Quad-State Trail and Missouri Statewide Trails System updated, Version 4 - what will trails in Missouri look like in 10 years?